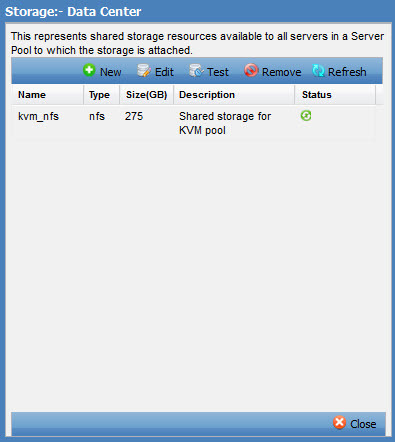 Welcome to ConVirt for KVM and Xen. 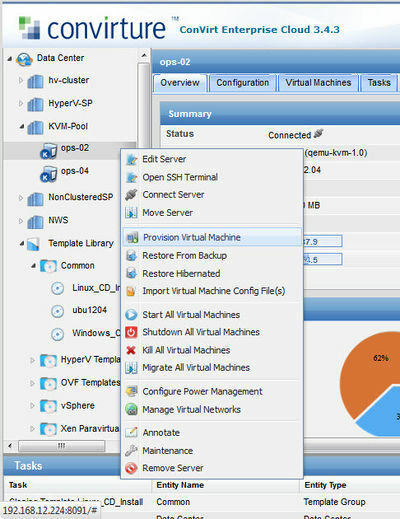 ConVirt is a multi-platform solution for managing your virtualization and cloud infrastructure, including VMware, Hyper-V, KVM, Xen, Amazon Web Services, OpenStack, and more. 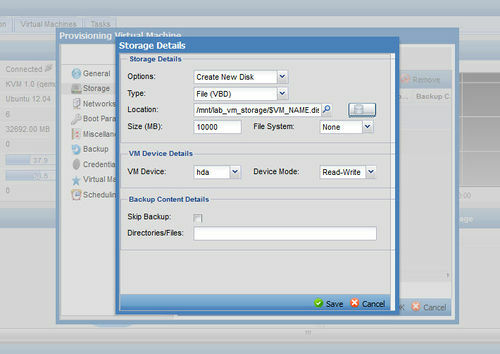 ConVirt enables you to manage thousands of hosts and virtual machines throughout their full lifecycle in a highly scalable and secure fashion, with advanced automation and orchestration features such as high availability, backup and recovery, policy-based workload management, and quota-managed self-service. 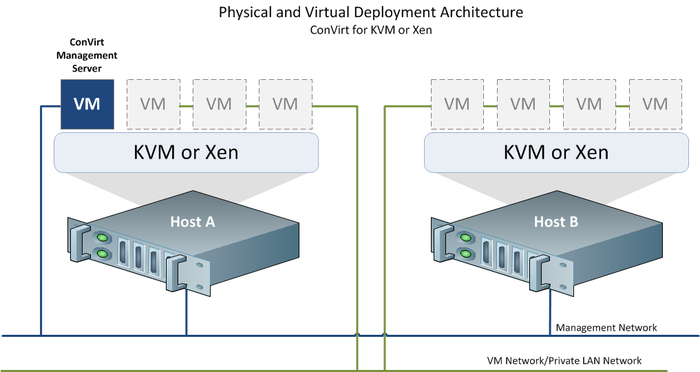 The physical deployment architecture for ConVirt for KVM and Xen shown in the diagram below is the minimum configuration needed to set up a "learning" environment. 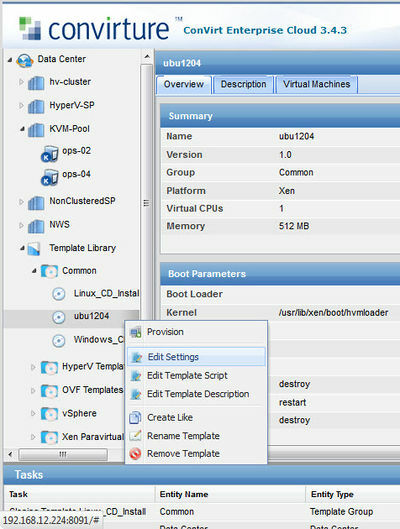 NOTE: For libvirt-managed KVM or Xen, the host import process is slightly different, make sure to refer to this libvirt addendum. 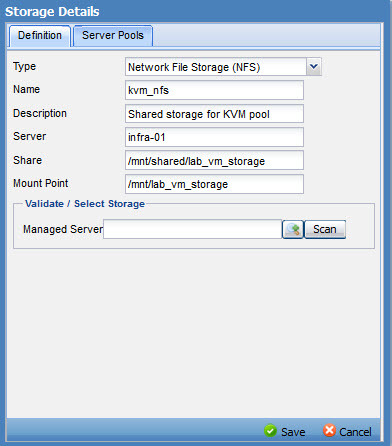 For the examples in this guide, we will use NFS storage. Internet access - you will need Internet access during your ConVirt setup, as some of the packages are downloaded over the network. Firewall - you will need to change the firewall on your network to allow TCP traffic on port 8091 and port range 6900-6999. 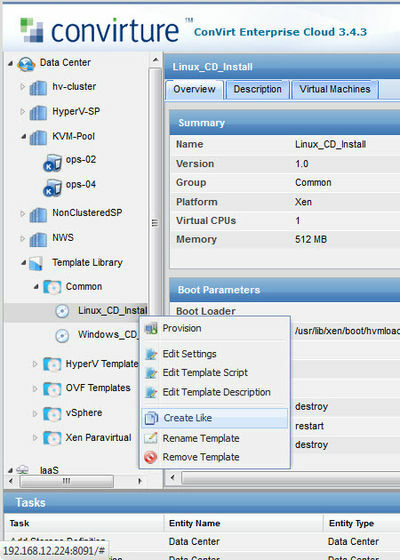 Instructions for setting up these resources can be found in the Set Up Network Resources section of the Feature Walkthrough: ConVirt for KVM and Xen. ConVirt is built on a 3-tier agentless architecture that delivers enterprise-grade scalability, security, and integration. 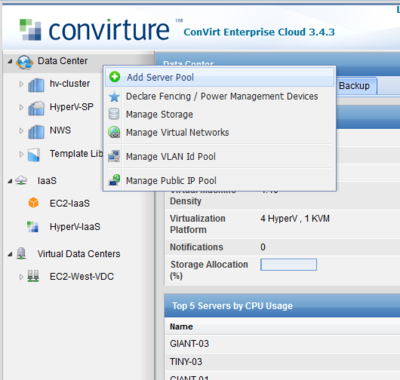 ConVirt allows you to monitor and manage your virtual and cloud infrastructure from anywhere via your web browser. 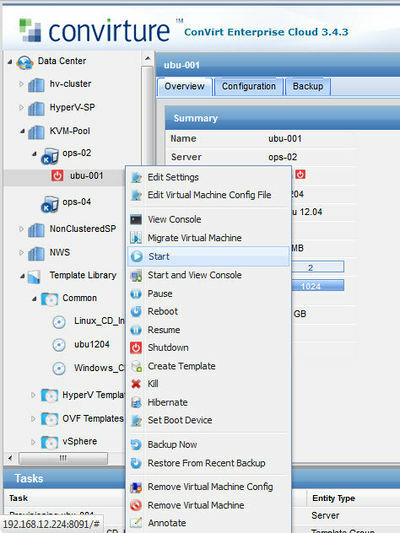 ConVirt provides a centralized, configurable data store for all of your virtual machine and server configuration, task history, and availability and performance information. 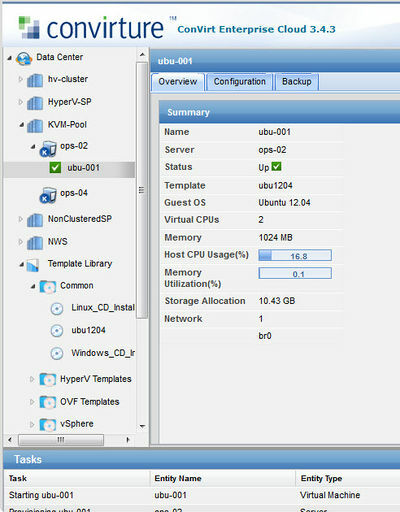 Because ConVirt does not require that you deploy an agent on the hosts being managed, it requires minimal effort to setup and install, it can be rolled out very quickly, and it scales effectively. 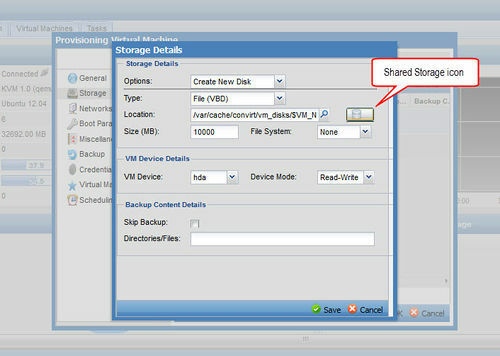 ConVirt enables you to share responsibility for managing your virtualized environment between multiple administrators while maintaining full accountability. If you are going to provision some new hosts for this learning environment, here are some high level instructions to get you started. 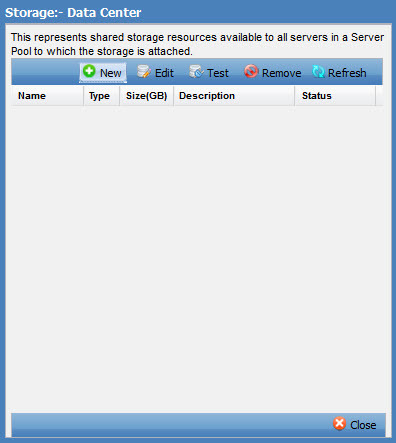 If you are going to import existing host servers, you can skip this step. 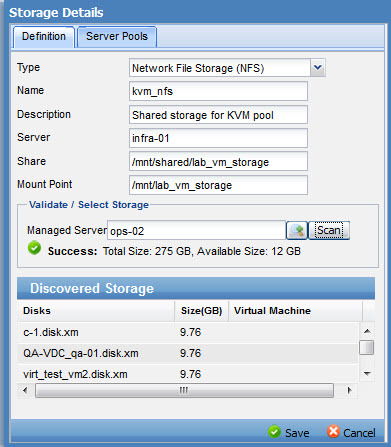 Install and configure KVM (kvm-70 or higher) or Xen (3.0.4 or higher) on the managed server. 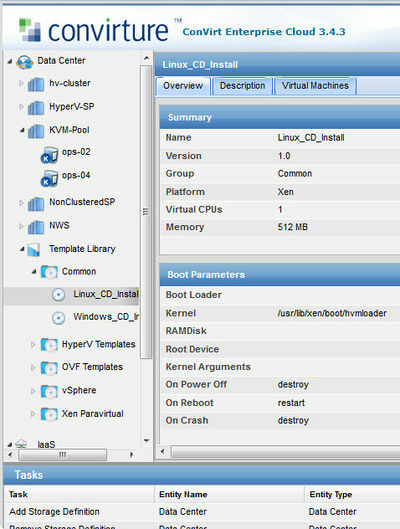 Note: chances are your linux distribution already includes either Xen or KVM. Almost all modern distributions do. For RHEL 6 users, please visit the RHEL/CentOS 6 Networking section before proceeding to next step. Use the link you received in the Trial email from Convirture. 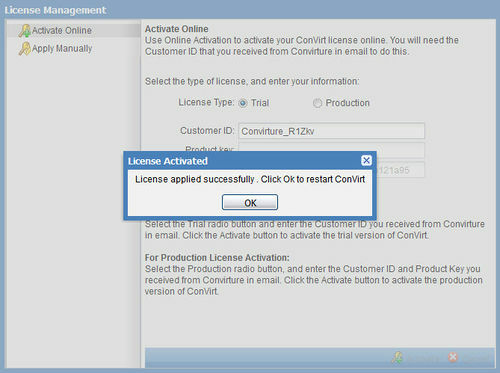 You should receive an alert "License applied successfully - Click OK to restart ConVirt". 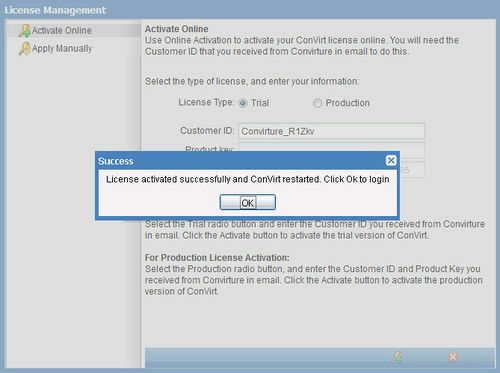 Click OK.
You should receive an alert "License activated successfully and ConVirt restarted - Click OK to login". 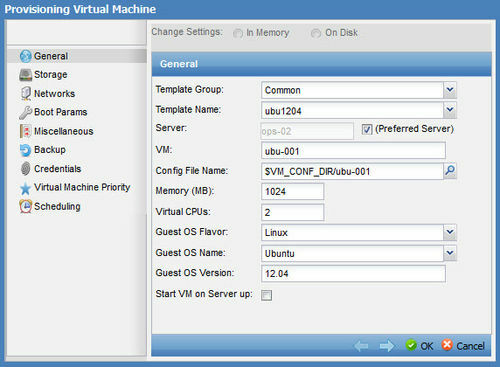 Click OK.
Before you start managing a host using ConVirt, you need to ensure that it's properly configured. This can be done easily in a few quick steps. NOTE: Each managed host needs to be prepared using the following procedure. 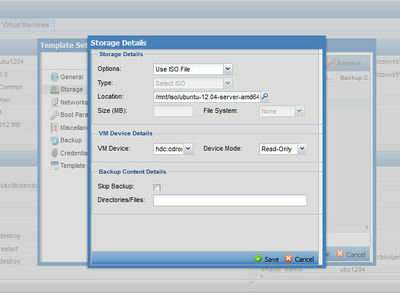 The convirt-tool script helps you make necessary changes to the managed host, so it is easily managed by ConVirt (CMS). For the Xen platform, running this command configures the Xend Server to listen on port 8006 and opens port 8002 for migration. The command also detects the default bridge and writes a summary of its operations to the /var/cache/convirt/server_info file. 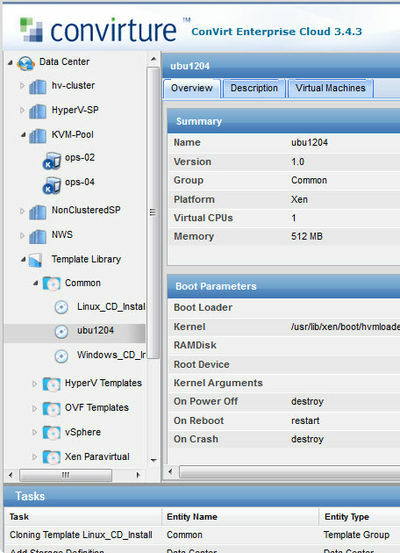 For the KVM platform, the command creates appropriate public bridges, required scripts and writes a summary of its operations to the /var/cache/convirt/server_info file. As a CMS user, log in to the managed host as root. DO NOT SKIP THIS STEP. 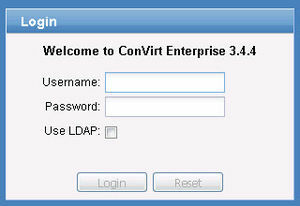 NOTE: ConVirt requires the ability to log in remotely using the root account. For certain distributions, the root password is not set by default. On such distributions, the root password must be explicitly set. Warning : This might disconnect the host server from the network, so please make sure you have an alternative way of getting to the server (Be on the server, iLO, DRAC etc). Also, in case the managed host is part of a cluster, the server might reboot because of network connectivity loss resulting in node fencing. 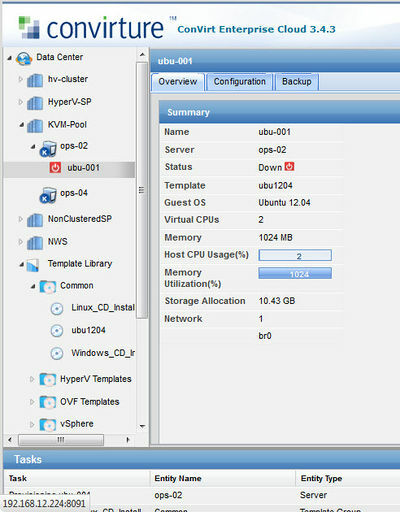 NOTE : Make sure that you have at least one bridge set up to which the virtual machines can connect. 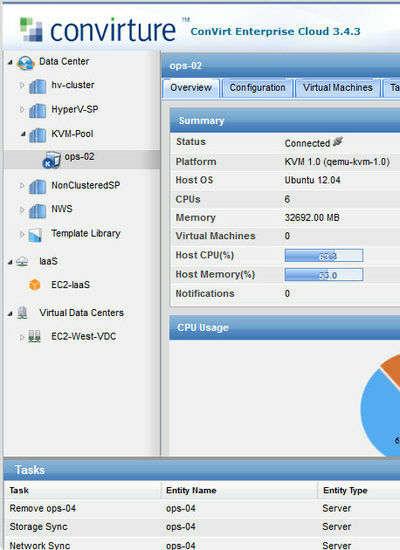 The ConVirt Management Console is a web-based dashboard that provides a single point of management and visibility into of your entire virtualized environment. ConVirt is multi-user, allowing the same environment to be managed by multiple administrators, and extensible, with multiple hooks for enterprise integration including LDAP/AD support, CLI, and API-based approaches. 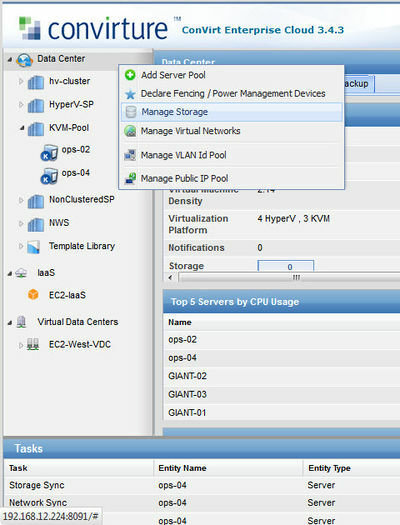 This pane displays an organized, hierarchical view of each entity managed by the system, including Data Centers (Server Pools, Hosts, VMs, and Templates), Infrastructure-as-a-Service Clouds (IaaS), and Virtual Data Centers (Self Service). 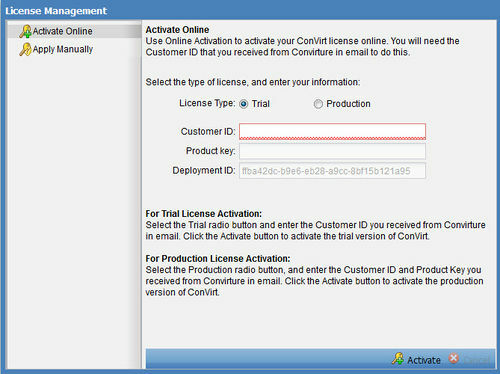 ConVirt has a highly interactive interface that allows you to use a context-sensitive menu on any entity to invoke the appropriate operations. 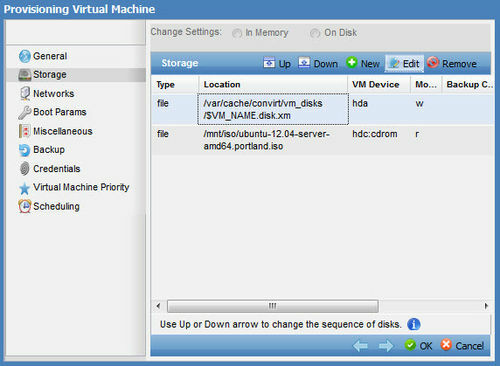 For example, if you select a VM, you can right mouse click to get to the context menu and invoke the desired operations. 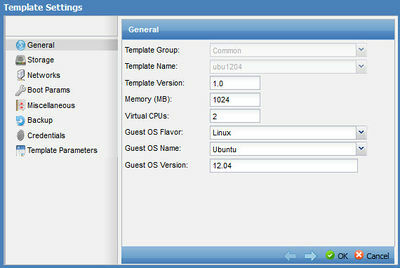 Each entity in the system has at least an Overview tab and a Configuration tab, and if appropriate, a Servers tab. The Overview tab shows summary information as well as information that requires attention. It also shows various charts that shows recent performance. 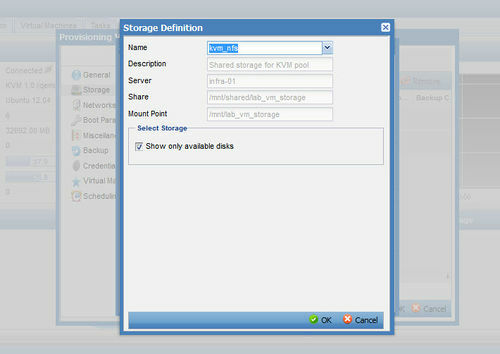 All operations within ConVirt are carried out via the task engine subsystem. 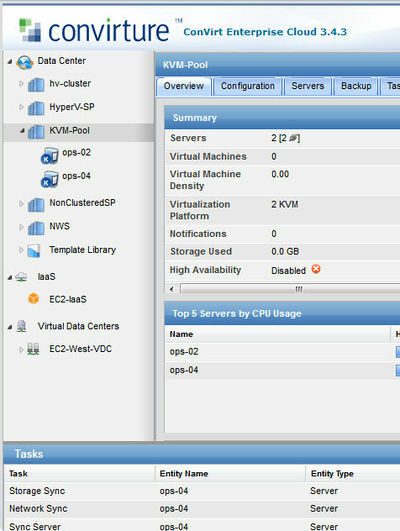 It runs periodic tasks of monitoring hosts and virtual machines, data rollups and periodic maintenance. Information about the tasks submitted and their status is presented in the task pane at the bottom. 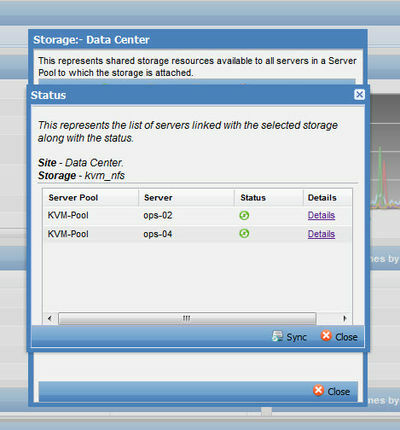 Server pools allow you to manage a set of hosts in a uniform fashion, including shared storage, network resources, and automation policies. 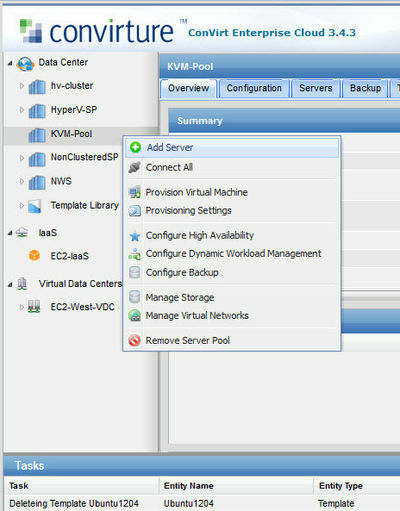 In the Navigation pane, right click on the Data Center and select "Add Server Pool"
Select the virtualization platform, give your new server pool a name, then click OK.
You should get a confirmation, and the new server pool should show up in the Navigation pane under the Data Center. 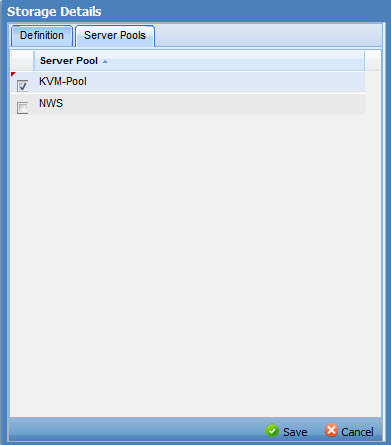 In the Navigation pane, right click on the server pool created above, and select "Add Server"
You will be prompted to select the platform. 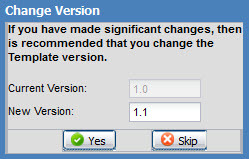 Choose the appropriate platform, then click OK. 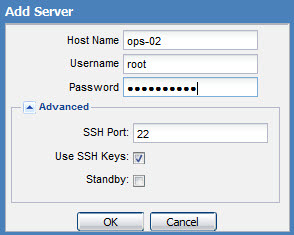 Type the host name or IP address of the server, and a user name and password for an account with permission to access the server. 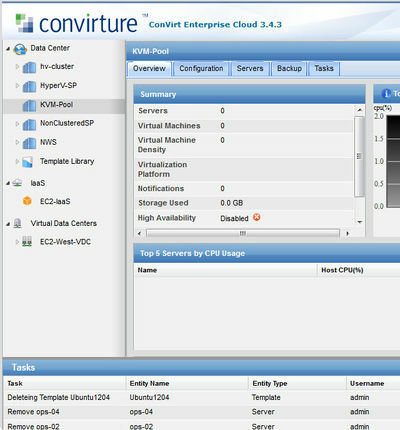 If the connection is successful, the managed host is added to the Convirt console. 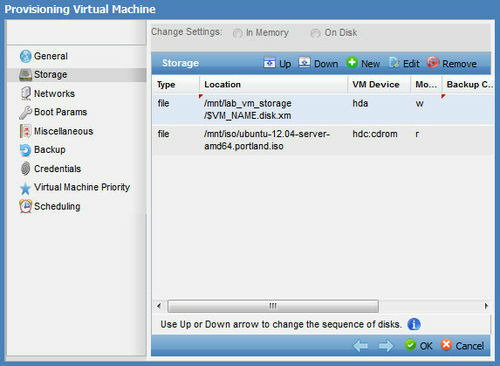 You can now create and manage the complete life cycle of virtual machines on this managed host. 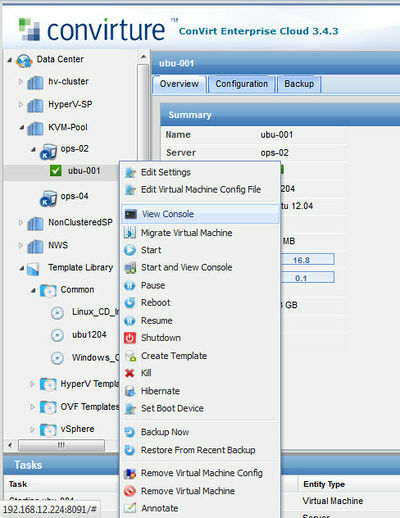 Use the same procedure to add your second managed host. 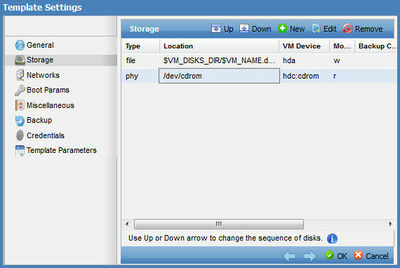 NOTE: If you want to update your Template to use shared storage by default, then copy the Location field from this dialog, and save it to the Storage>Location field for the first disk in the Template.